It took a little longer than planned to get the book done, but the extra polish was worth it. Available now and exclusively from DrivethruRPG.com, find Mallavray’s Magnificent Manual of Magical Marvels and enjoy 50 entries of magic items, artifacts, and even a couple of spells to fire the imagination of treasure-hungry adventurers. Cocooned within his flying super-library and fortress ship, the magnanimous arch-wizard Mallavray flies between the Weeping Worlds collecting and cataloguing mysterious magical marvels that are of the kind to gleam in the eye of every ambitious adventurer. Replete with a full sized restaurant and cafe annex, Mallavray invites each world he visits to share in his library-ship and discover amazing artifacts, mysterious magic, and powerful pranks. Mallavray can only visit one world at a time though, so he has penned his first masterwork – a magnificent manual to index his favourite 50 magical items and artifacts that he can share with everybody. The goal is to give a teary-eyed laugh to the avid reader and give every eager adventurer a list of powerful but sensible baubles to keep their eye out for and add to their arsenal of options. 50 painstakingly analyzed magical items with not only rich and flavourful descriptions and histories but also divinely inspired technical balance. 15 amusing illustrations of some of the best treasures to serve as warning to avoid or perhaps clues to seek out for adventurers looking to acquire such items! Written foreward, asides, and closing remarks from Mallavray himself. Full colour cover featuring the reclusive arch-wizard Mallavray surrounded by some of his collection. Mallavray is a hungrily curious arch-wizard and wants to find out about all the kinds of magic items that he can. To that end he has invited other wizards from across the realms to send him their own favourite creations, that he might add the very best 3 items or artifacts to the book and give complete praise and credit to their creators. Not just credit will go to the creative though, as those that submit the best 3 items will each receive a physical copy of Mallavray’s book flown straight to their house(or apartment or office or etc), delivered by eldritch owl(or post office, whichever is more convenient). The contest can be entered by following the link here. Submissions close March 1st. Below is a sample of the kind of item found in Mallavray’s book, an item both practical and absurd in equal measure! These rugged leather farm boots look like they’ve seen a thousand muddy days and are deeply stained but still appear in good physical condition otherwise. The boots bestow the wearer with an increase of their base land speed by 10 feet (considered and enhancement bonus). In addition to the speed increase the boots will also summon the nearest horse directly to the wearer every 12 hours. While the land speed increase effect will begin immediately after the boots are put on, the first horse will not be teleported to the wearer until the boots have been worn for exactly 12 hours, thereafter the nearest horse will be teleported to the wearer and every 12 hours after that. The horse will appear close to the wearer in the nearest unoccupied safe squares that can accommodate a large creature. Once the boots are worn they cannot be removed unless with the aid of a remove curse spell or similar magic. For the purposes of the teleportation effect a ‘horse’ is defined as “a hoofed plant-eating domesticated mammal with a flowing mane and tail, used for riding, racing, and/or to carry and pull loads.” and as such any creature matching that description from pony to Clydesdale (or other-dimensional creature that matches the definition) will be targeted by the teleportation effect. The same horse can be teleported more than once as long as it is the nearest horse when the 12 hour timer resolves. The horse is always a real horse that has a history of existence. The spell does not create a horse but merely teleports an already existing one. The horse arrives with whatever saddle, equipment, or barding it was wearing however if the horse had a rider or was pulling a wagon or load at the time that it was teleported then the rider or wagon/load is left behind. 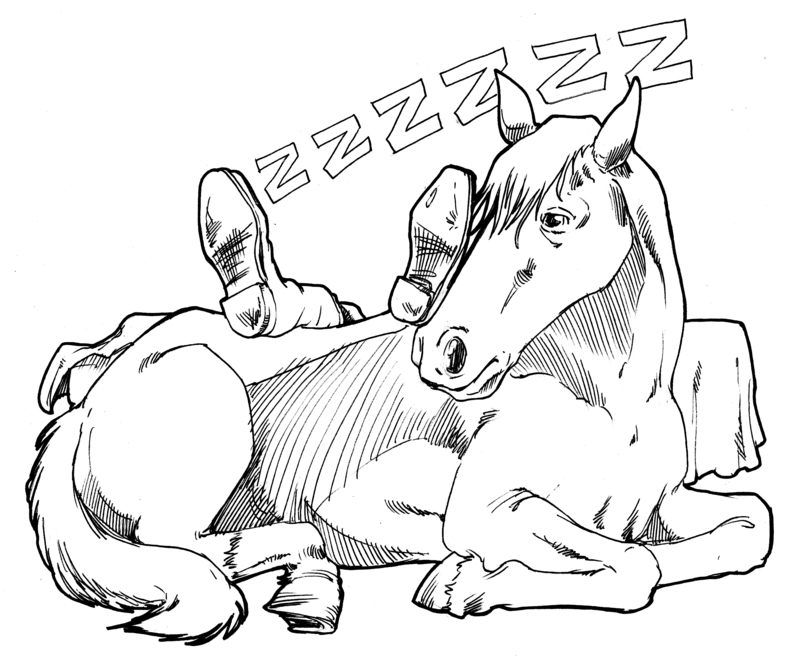 The only circumstances that will prevent the horse-teleportation effect are if the wearer of the boots are currently engaged in riding a horse or if there are no horses on the current dimensional plane of the wearer. I’ll be releasing the survey results soon and emailing the winners their copy of the game. 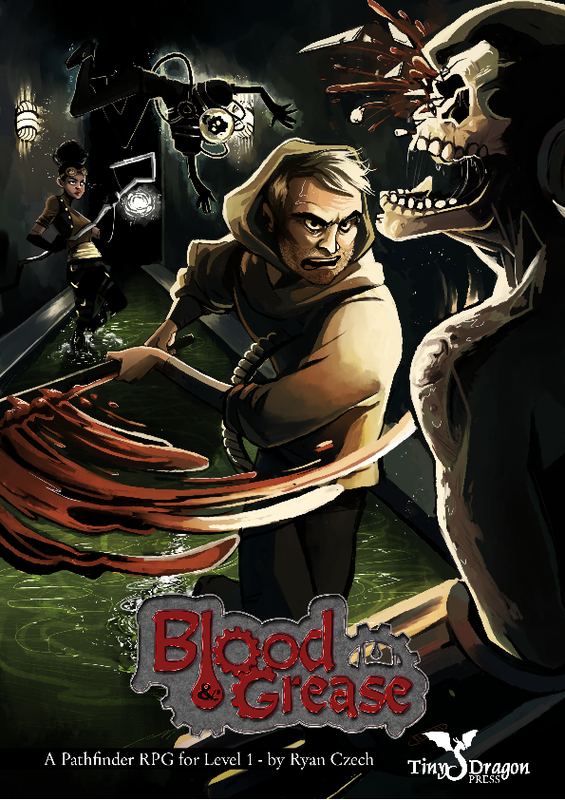 The final version of the pdf for Blood & Grease has been sent off to drivethrurpg.com to review… within 1-3 days the adventure module will be live on their site! I’ll make a new post linking to the store page when it’s available. In the short time before Tiny Dragon Press releases its first adventure module, I wanted to offer a few copies to give away as a bit of a gift. To be entered into the draw to get a copy of the module just follow the link below to a short survey about playing and purchasing habits, you can fill in your email address and the three emails I draw will get sent a copy of the Blood & Grease module! Drawing is on the 7th of Jan. The module should also be available on Drivethrurpg.com on the 7th as well.